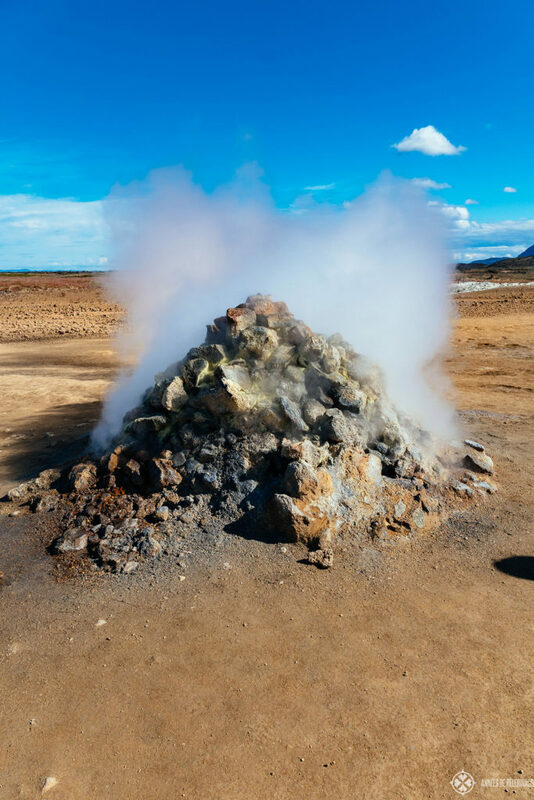 Steam vents, geothermal pools and the smell of sulfur, this travel guide will show you everything you need to know about the Hverir geothermal area near Lake Mývatn, Iceland. Incidentally, Hverir actually has quite a history. During the late medieval times, half of the sulfur Europe needed to fuel it’s increasingly gun powered wars were mined here. 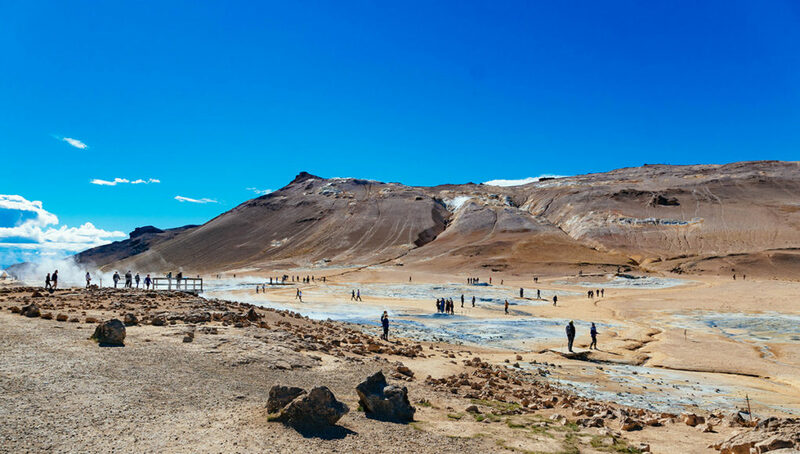 Few tourists now visiting would even have heard of trading outposts like Gásir, but I’ll invite you to come on a journey through the infernal world of the Hverir geothermal area. 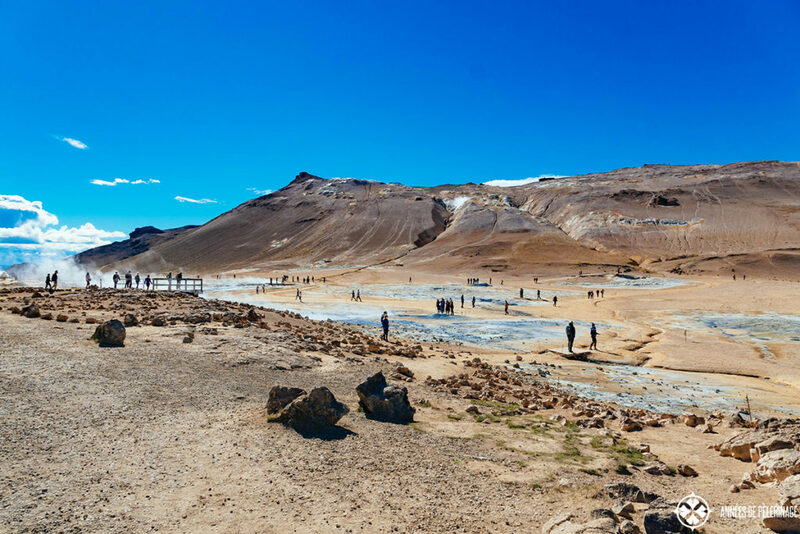 Note: Hverir is part of my list of 20 most amazing things to do in Iceland. 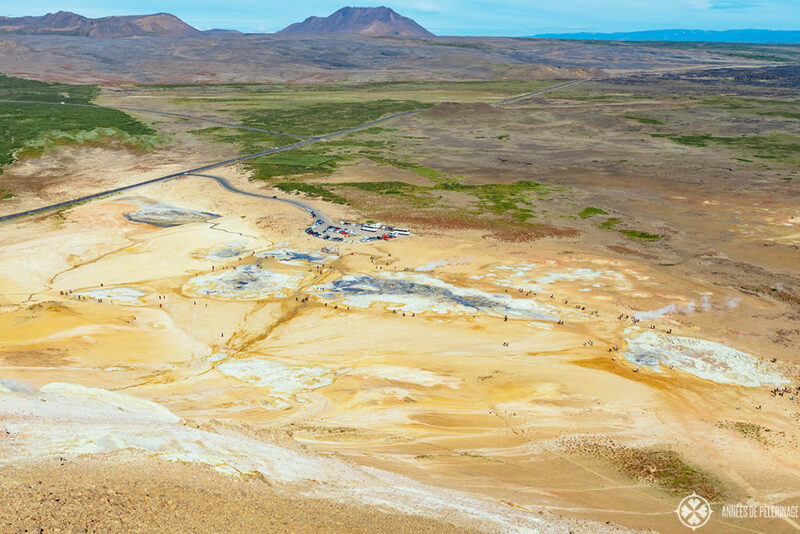 Hverir is just one of many geothermal fields in Iceland. But it’s probably the largest and most importantly very easy to access. It’s basically sitting right next to the ring road and you can see the billowing clouds of hot water vapor steaming up from miles and miles away. Námafjell is the actual name of this geothermal area most tourist doing a road trip around Iceland visit. Even from the parking lot of Hverir, you hear a loud hissing noise accompanied by the fierce smell of fumarole gas. 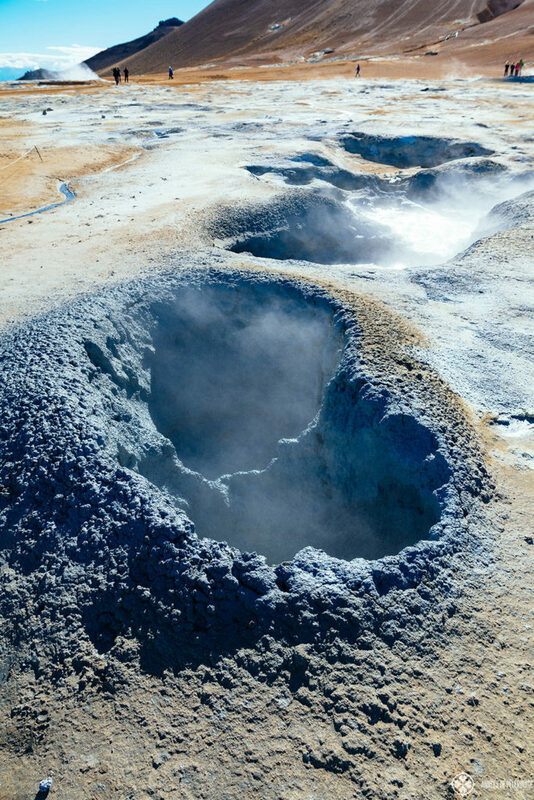 These are fumaroles, or more commonly known as natural steam vents, and Hverir has two very fine specimens. The got the feeling of being artificial, yet they are not. The steam has a sulfurous stench, an indicator of hydrogen sulfide within the gas. Fear not, the concentration is not very high, so it’s not dangerous, but obviously, you do have to be careful with the sheer heat of the vapors. Wonder what mud pools are? 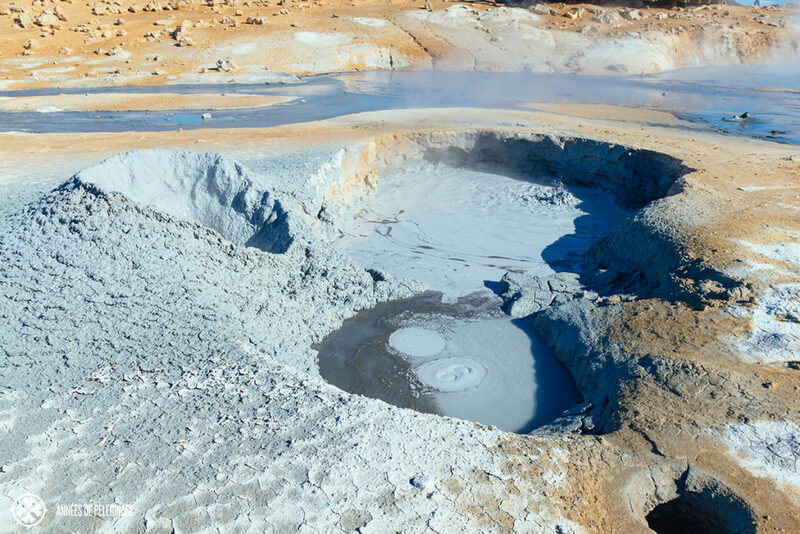 Mud pools or mudpots are formed when a little water collects in the rich volcanic ash surrounding a fumarole. 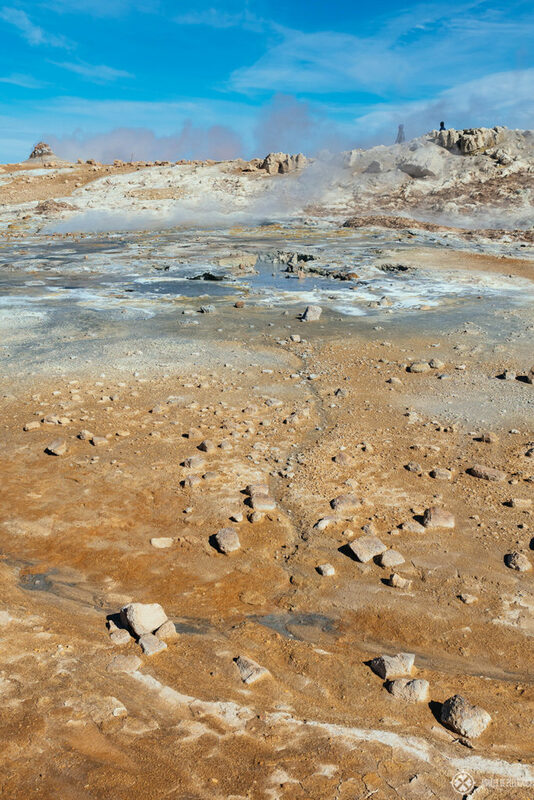 In Hverir you got a couple of very spectacular mudpots blubbering away in equally sulfurous stench. I like the mud pools more than the steam vents, as they are somewhat even more surreal. They remind me of fantasy movies from the 1980ies, where the hero or heroine would inevitably search the evil lord in some dark lands. 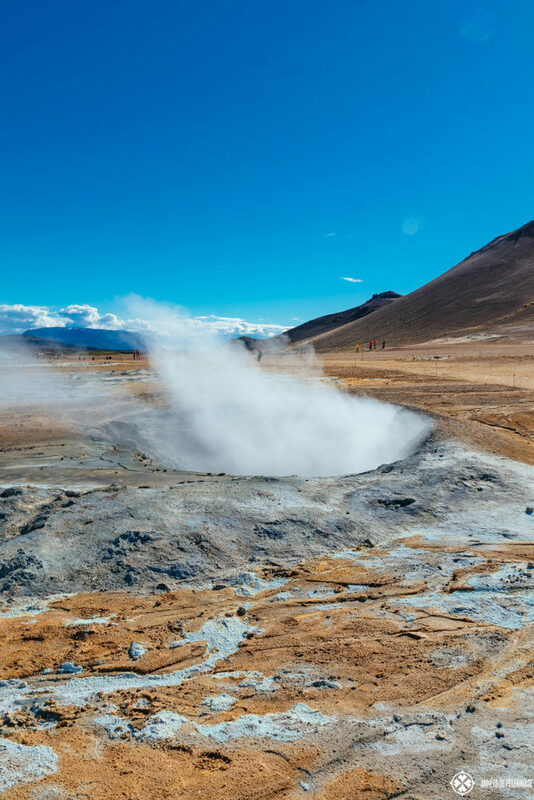 Are there any geysers in Hverir? 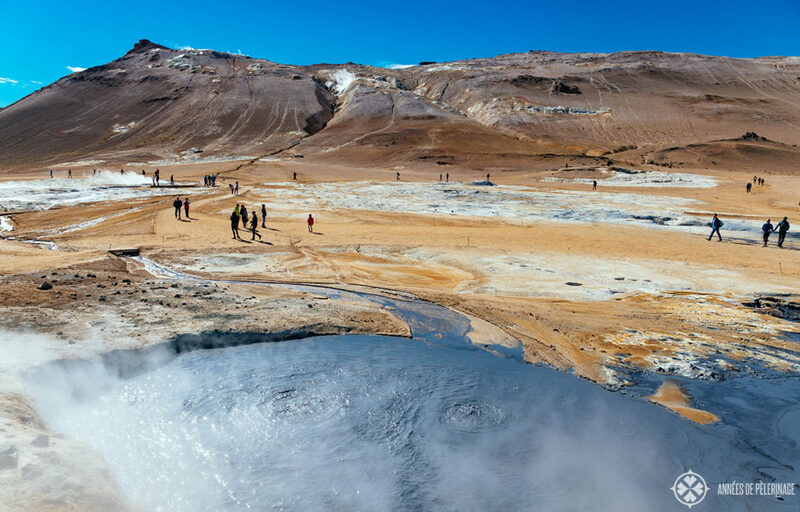 There are no true geysers in Hverir. 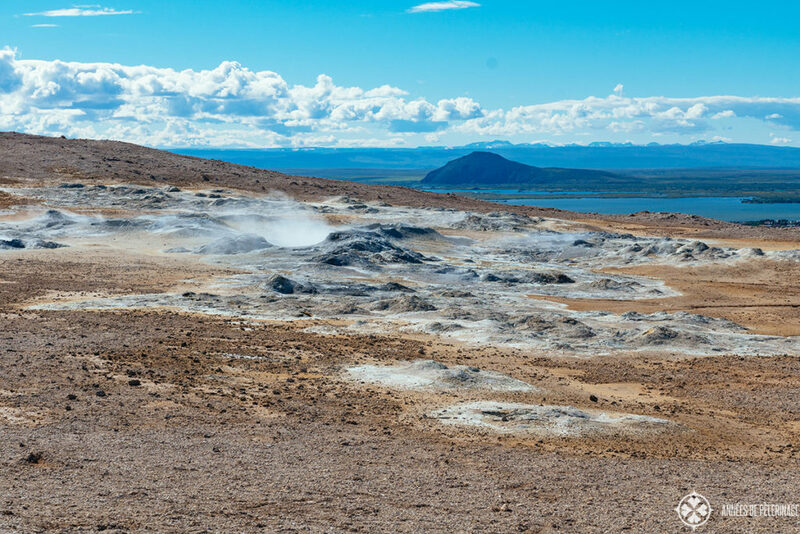 These can only be seen around the Golden Circle, where Strokkur is pretty active (erupting every 6-10 minutes). It’s more or less a problem of the geology that doesn’t allow it. But just how does it work? 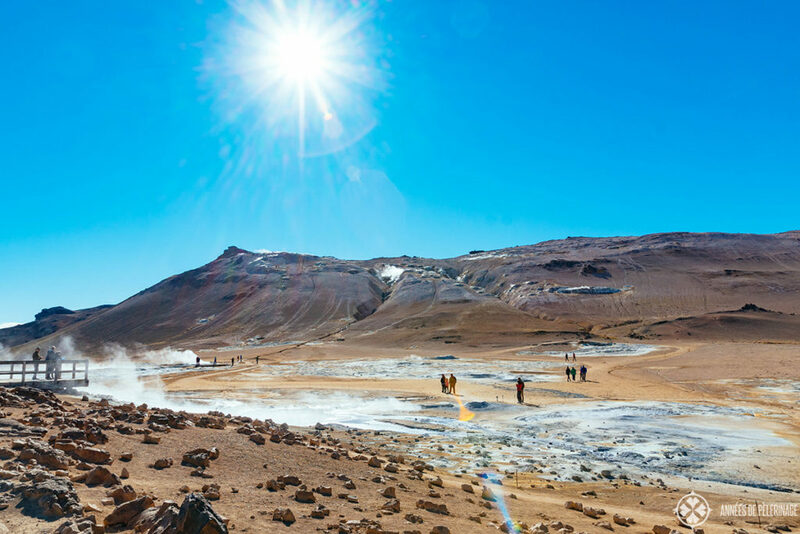 Cold (ground) water seeps down to the magma layer, where it is superheated (up to 200° Celcius), transformed into steam and then comes back to the surface. This superheated water is mixed with hydrogen sulphid. 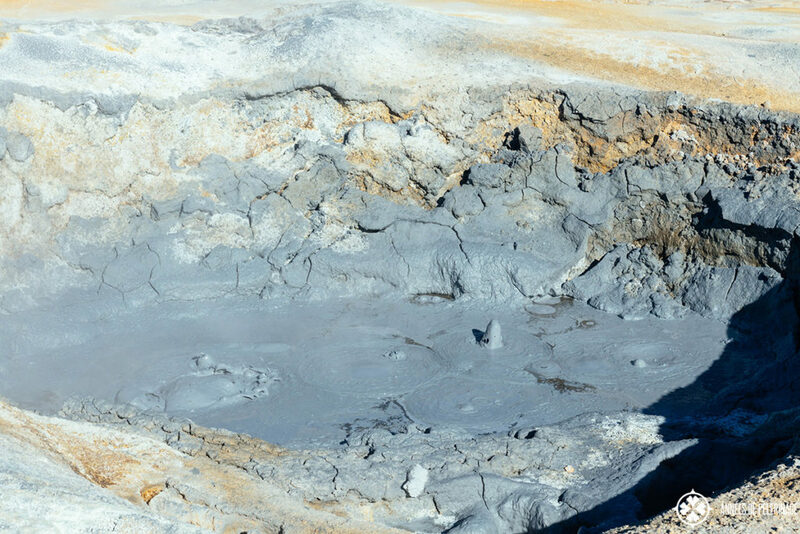 In mud pools, this fumarole gas is transformed into sulphuric acid. Which dissolves the rock and soil, producing the mud which is so typical of mud pots and their surroundings. This mud water would be, technically speaking, way to cohesive for a geyser to work. The geothermal field right next to the parking lot is quite amazing. But I urge you to bring a little more time (like 1 hour) and hike onwards into Námafjell. Behind the geothermal fields, you can see a hill. From its crevasses vapor is constantly steaming away, and you do want to get to the top of that hill. 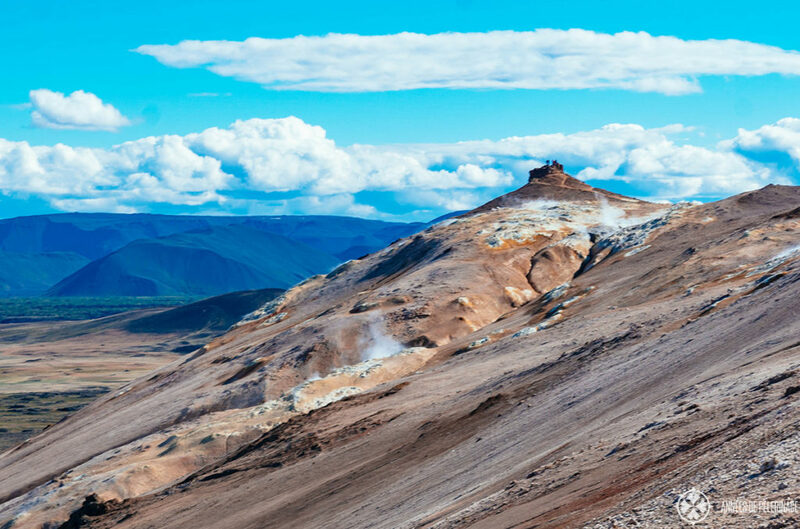 From the top, you can enjoy the view of Námafjell, the surrounding pseudocraters, deep volcanic fissures, subsidence calderas, volcanoes and so much more. But more importantly, this area is less crowded and just as amazing. 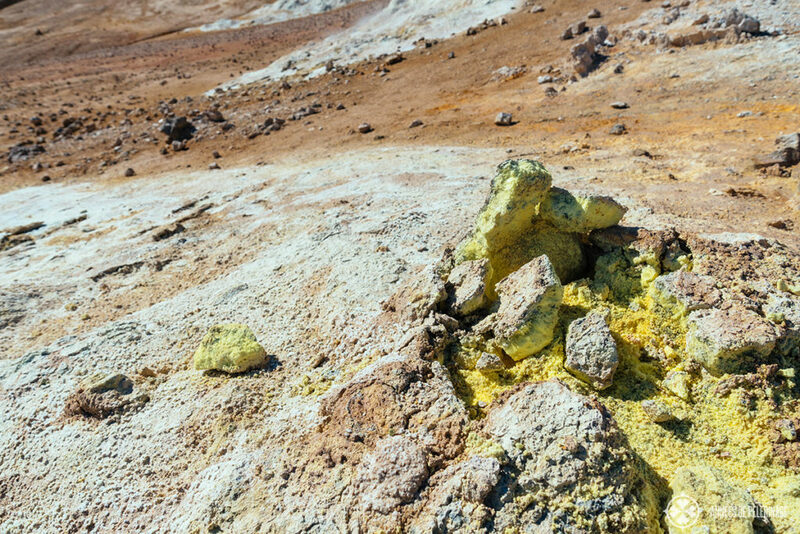 There are a couple of more steam vents up there, and a couple of very pretty sulfur vents as well. In fact, I liked this part more than below. But then again I was never a big fan of big crowds and many people. There are two ways leading upwards. I’d recommend you to take the pathway on the right side of the hill, as the trail from the left is very steep. Since the ground is more or less just mud, it can be quite perilous – especially when it rains! You probably heard of the Blue Lagoon already. But Mývatn also has a smaller lagoon which basically works on the same principle. 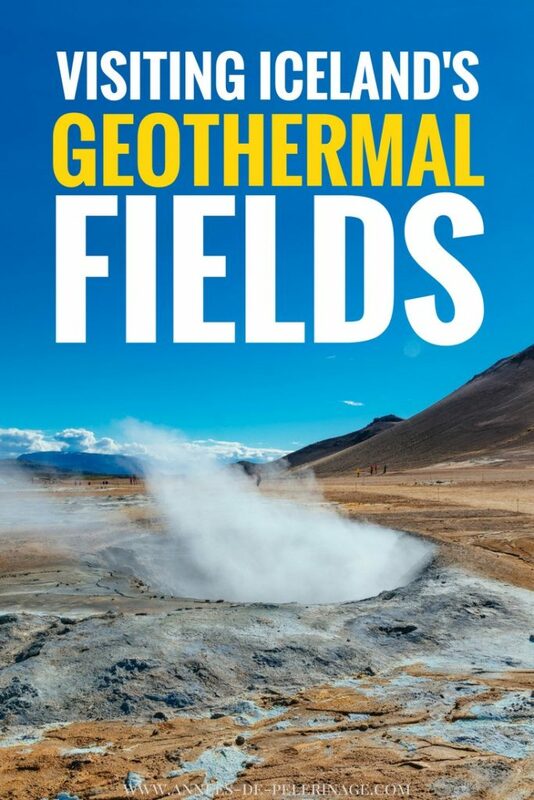 A nearby geothermal plant pumps water into the soil and the silica-rich refuse is used to heat the bath. It is the silica that gives the water it’s rich teal color. If you are in the area of Mývatn you might consider ending your day at the Mývatn Nature Baths (here’s their website). It’s one of the bigger geothermal pools in Iceland, and not truly an insider tip anymore, mind you. If you just want to take some pretty pictures of the blue water, you can stop at the geothermal plant (there is a small parking lot in front), and enjoy the surreal feeling of the little lake close to it. Missing Hverir is quite hard. It’s roughly 6 kilometers East of Lake Mývatn (Reykjahlíð), right after a little mountain pass. From Akureyri, you probably need about 1 hour. From Egilsstaðir it’s about 2 hours (170 kilometers) away on the ring road. There is a big parking lot in front of the entrance to Námafjell and no hiking is required to see the central area. If you move onwards, normal trainers or mountain trainers is all you need (check out my guide on the best hiking boots for Iceland). There are, however, no toilets there. Like almost all tourist attractions in Iceland, there is no entrance fee. 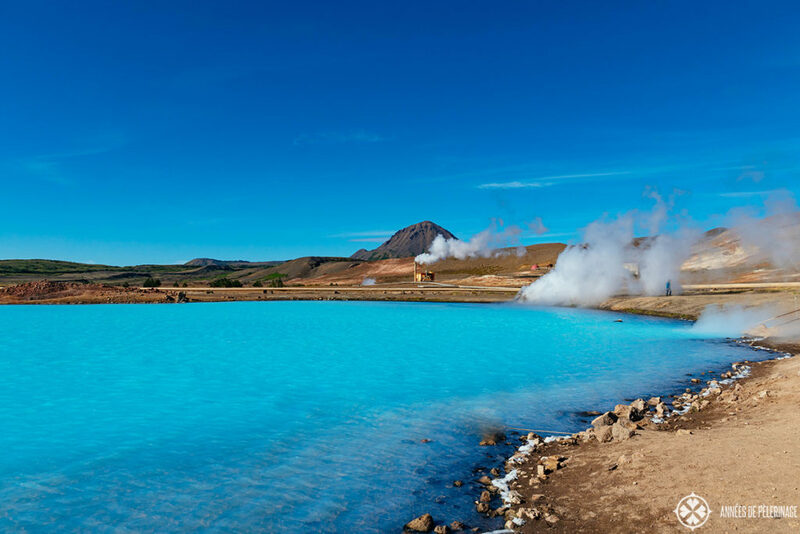 Have you been in Hverir and the Lake Myvatn geothermal area yet or plan to go? Tell me your thoughts in the comments below. Oh, and don’t forget to pin this to your Pinterest board.